Six specially constructed ditches previously excavated at Eberdingen-Hochdorf a 2,550-year-old Celtic settlement, were used to make high-quality barley malt, a key beer ingredient, says archaeobotanist Hans-Peter Stika of the University of Hohenheim in Stuttgart. 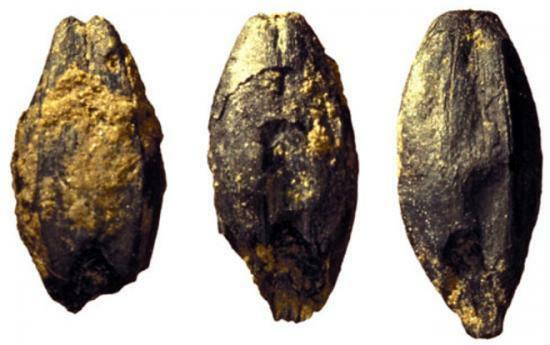 Thousands of charred barley grains unearthed in the ditches about a decade ago came from a large malt-making enterprise, Stika reports in a paper published online Jan. 4 in Archaeological and Anthropological Sciences. Stika bases that conclusion on a close resemblance of the ancient grains to barley malt that he made by reproducing several methods that Iron Age folk might have used. He also compared the ancient grains to malt produced in modern facilities. Upon confirming the presence of malt at the Celtic site, Stika reconstructed malt-making techniques there to determine how they must have affected beer taste. The oldest known beer residue and brewing facilities date to 5,500 years ago in the Middle East, but archaeological clues to beer’s history are rare (Science News: Oct, 2, 2004, p. 216). At the Celtic site, barley was soaked in the specially constructed ditches until it sprouted, Stika proposes. Grains were then dried by lighting fires at the ends of the ditches, giving the malt a smoky taste and a darkened color. Lactic acid bacteria stimulated by slow drying of soaked grains, a well-known phenomenon, added sourness to the brew. Unlike modern beers that are flavored with flowers of the hop plant, the Eberdingen-Hochdorf brew probably contained spices such as mugwort, carrot seeds or henbane, in Stika’s opinion. Beer makers are known to have used these additives by medieval times. Excavations at the Celtic site have yielded a few seeds of henbane, a plant that also makes beer more intoxicating. “These additives gave Celtic beer a completely different taste than what we’re used to today,” Stika says. Heated stones placed in liquefied malt during the brewing process — a common practice later in Europe — would have added a caramelized flavor to this fermented Celtic drink, he adds. So far, no fire-cracked stones have been found at Eberdingen-Hochdorf but they may have been used to heat pulpy malt slowly, a practice documented at later brewing sites, Stika says. He suspects that fermentation was triggered by using yeast-coated brewing equipment or by adding honey or fruit, which both contain wild yeasts. Celts consisted of Iron Age tribes, loosely tied by language and culture, that inhabited much of Western Europe from about the 11th to the first century B.C. In the same report Stika describes another tidbit for fans of malt-beverage history: A burned medieval structure from the 14th century A.D., recently unearthed in Berlin during a construction project, contains enough barley malt to have brewed 500 liters of beer, the equivalent of nearly 60 cases. Classics professor Max Nelson of the University of Windsor in Canada, an authority on ancient beer, largely agrees with Stika’s conclusions. Malt-making occurred at Eberdingen-Hochsdorf, and malt was probably stored in the medieval Berlin building, Nelson says. Other stages of brewing occurred either at these sites, as suggested by Stika, or nearby, in Nelson’s view. “Stika’s experiments go a long way toward showing how precisely barley was malted in ancient times,” he remarks. Beer buffs today would regard Celtic beer as a strange brew not only for its flavor but because it would have been cloudy, contained yeasty sediment and been imbibed at room temperature, Nelson notes. Stika’s insights into the range of techniques and ingredients available to Celtic beer makers should inspire modern “extreme brewers” to try out the recipe that he describes, says anthropologist Bettina Arnold of the University of Wisconsin–Milwaukee.